Baker, Columbia and Union Counties, north Florida Farmer's Markets: Find a local farmer's market near you in Baker, Columbia and Union Counties, north Florida for fruit, vegetables, pumpkins, organic foods,local produce and more! Looking for a local, true farmer's market in Baker, Columbia and Union Counties, north Florida? Scroll down this page and you will see the farm markets, farm stands, roadside stands, produce markets, even garden fruit and vegetable stands and seasonal community farmer's markets in Baker, Columbia and Union Counties, north Florida, sorted by county. Markets offering organic or sustainably grown produce are identified by the words "organic" and/or "sustainable" in Green, next to their name. If they have a website, the name will be in blue and underlined; click on it and it will open their website. 205 N. Marion Ave. Lake City, FL 32055. Phone: 386-719-5766. Open: every Saturday from 9am to 1pm. The relocation of the Lake DeSoto Farmers Market while construction took place on Darby Pavilion in Wilson Park since last September to the parking lot at the corner of Marion Avenue and Highway 90 (Duval Street) across from the Courthouse Annex, has offered the market vendors frontage along Highway 90 and a heightened visibility to motorist traveling on Highway 90 (Duval Street). The vendors have chosen to continue to operate the market every Saturday from this strategic location. As you consider your shopping list do you think about where your food comes from? Is your food more traveled than you are? 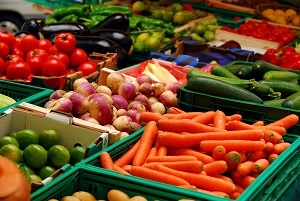 Consider shopping at the farmers market for your perishables this week. You will find vegetables, dairy products (cheese, milk and yogurt), eggs and baked goods. The foods found at the Market are LOCAL! Small farmers/gardeners are growing these vegetables in their own "backyards". In most cases, it is grown as nature intended, with no pesticides or chemical fertilizers. Downtown at SR 231 and SR 100 , Lake Butler, FL. Phone: (386) 496-4063. Open: May - Jul: Saturday, 8 am to 12 pm.